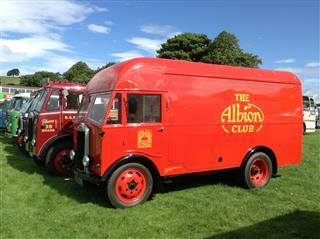 Welcome to the joint website of the Biggar Albion Foundation Ltd and the Albion Vehicle Preservation Trust. These two organisations currently look after Albion owners, enthusiasts and enquirers. The Biggar Albion Foundation (Scottish Charity No. SC031203) is based in Biggar, Lanarkshire, Scotland. The Foundation is responsible for the Albion Club, the Albion Archive, the Biggar Rally and the Albion Museum at North Back Road, which houses a collection of historic Albion vehicles and units. Other historic Albion vehicles are owned and housed at other locations from time to time, including Bridgeton Bus Museum. The Albion Club publishes The Albion Magazine quarterly. Membership is open to all interested in Albions, whether owners or not. A small stock of Albion spares is also kept by The Club. The Foundation works closely with the Albion Vehicle Preservation Trust, which owns two Albion coaches. The AVPT keeps the Register of Preserved Albions and operates this website on behalf of both organisations. The Albion Magazine now incorporates the Albion Vehicle Preservation Trust Newsletter. The Albion Archive is available to members and is one of the most comprehensive commercial vehicle archives in the UK. More details on the Albion Club and Albion Archive can be found on the Contact Us page. The Albion Vehicle Preservation Trust (Scottish Charity No. SC028791) was formed in 1967 to purchase, garage and rally one of the last Albion heavy coaches, a 1950 Valiant, and in 1991 a 1967 Viking coach doubled the fleet. In a joint arrangement with the Albion Club, the AVPT keeps the register of preserved Albions and has so far collected details of over 1,000 Albions surviving worldwide. If you have a preserved Albion, or if you discover an unrestored Albion anywhere, please send details of chassis number, registration number and owner to us - details are on the Contact Us page. Albion was established in 1899 in Glasgow, the second city of the Empire, already renowned worldwide for its engineering excellence. Albion's motto "Sure As The Sunrise" was adapted into the logo which featured on the radiator and badges of their models for many years and helped to establish their identity wherever they operated throughout the world. To help us raise funds to expand our museum. We are looking to raise £150,000 by end of July 2020. 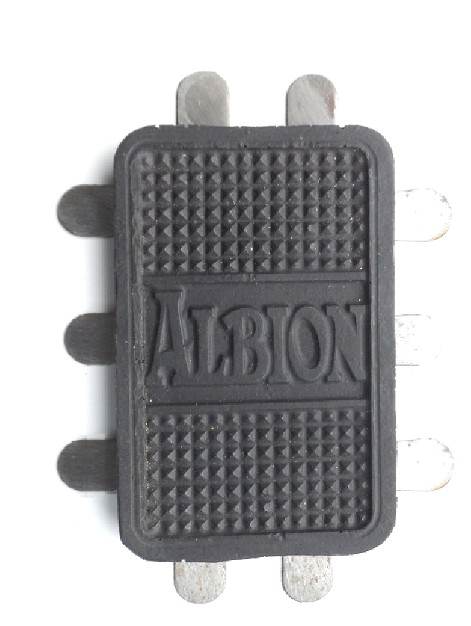 Club item - Albion pedal rubbers. Large style available as shown, complete with backing plates. Small style also available at same price. £40 a pair plus £3.30 postage and packing (to the UK).